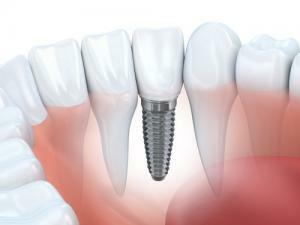 Dental tooth implant is a small screw made of titanium. They are placed in the jawbone by an oral surgeon. During the healing period these screws become integrated in the structure of the bone and afterwards are durable enough to carry crowns, bridges or other types of dentures. Patients usually don’t even notice the difference between their own teeth and a dental tooth implant. Single missing teeth where the neighbouring ones are sound. In these cases we don’t have to harm healthy teeth to replace the missing ones. We only place one tooth implant into the gap and place a single crown over it after a few months. Missing tooth/teeth at the end of the arch (posterior of the remaining teeth) – in this case it is not possible to replace the missing teeth with a bridge or any fixed prosthesis. With the placement of dental implants this problem can easily be solved. In case of total edentulous patients implants could even hold a full-house bridge if a sufficient amount of implants can be placed. After a previous tooth extraction or in case of periodontal disease, the amount of bone is quite often not enough to place an implant. Nowadays surgery makes it possible to replace the missing volume, giving space for dental implants and often support for partial dentures to last for a longer time. Following surgery it is often unavoidable that cheeks get swollen. For that case we recommend mild cooling with ice packets. It is of great importance that proper oral hygiene is maintained after surgery: try to brush as many times as possible, since the intensity might be hindered due to discomfort. At the reception you will recieve a detailed description about the dos and don’ts of the postop period. After a week our patients return to the office for control and removal of the stitches, which is free of charge, as are all the other consultational and control appointments. Our experience for the last several years, as well as our patients’ feedbacks, are proof that dental implants and their restorations work fairly well in almost every situation. Thanks to scientific innovations, nowadays the number of implants needed to rehabilitate total edentulous patients is decreasing. This has a positive effect on financial aspects as well. To treat total edentulism, previously 6-8 implant were needed. Today, thanks to special types of implants, only 4 are enough to give back the total arch. Due to this technique you can say goodbye to wobbling dentures and swap them for a fix solution on 4 implants! After surgery you can immediately get a temporary denture that is fixed to the implants, so you don’t have to spend even a day without teeth. 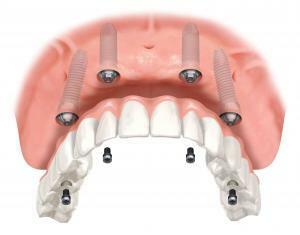 After 2-3 months with the temporary denture, you will get the final construction which we call a full-house bridge. This is a protocol that has been refined over the last decade and improved to its present level in implant dentistry.